Marigolds are such cheerful little flowers, it's no wonder why flower gardeners love them. But, while relatively easy to grow, marigolds are not without issues. Perennial and annual varieties of marigolds are susceptible to a number of diseases, whether grown in greenhouses or out of doors. If you find that your marigolds repeatedly fall prey to a certain disease, consider planting a more resistant variety. Botrytis blight is a fungal disease that often crops up after periods of abnormally damp weather. 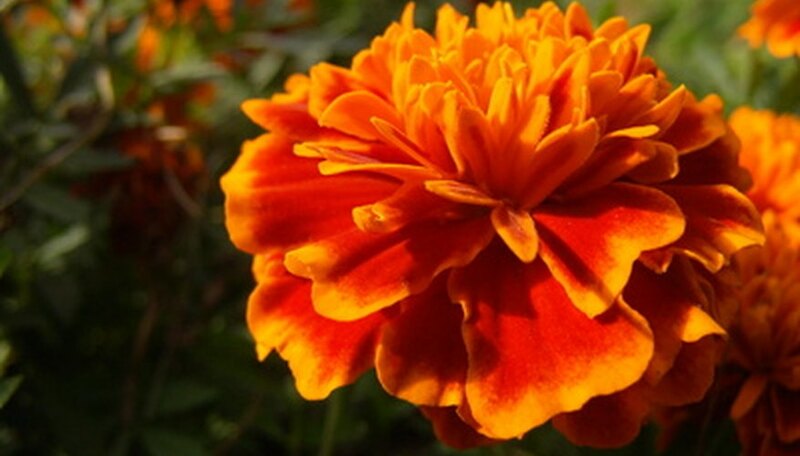 Affected marigolds develop large brown patches of dead or dying tissue. Silver spores spotted in the center of these patches are germinating fungal spores. The best treatment for botrytis blight is to immediately remove the affected plant material (or the entire plant if more than one-third of the plant is affected) and any plant debris or mulch lying in the bed. Marigold oedema most often strikes in late winter. Oedema occurs when marigold roots absorb water faster than the plant can use it. The excess water then builds up in the plant causing small, swollen blisters on marigold leaves and flowers. As the blisters age, they harden and form white or brown wart-like bumps and eventually cause the foliage to yellow and drop. Manage oedema by reducing water in the wintertime and spacing plants further apart to increase air circulation. Powdery mildew can be caused by any number of fungi that produce a white, powder-like coating on marigolds that is easily rubbed off. As the disease progresses, the leaves and buds become stunted and distorted and eventually drop. Control the spread of powdery mildew by pruning affected plant material or disposing of affected plants. Reduce moisture by switching to drip irrigation to avoid wetting the leaves. Virulent infections can be treated with a a sulfex solution (3 grams per liter of water). Southern bacterial wilt largely affects marigolds grown in warm climates. In early stages of the disease, the foliage wilts, becomes stunted and turns a light yellow or grey-green color. Within a week or two, the plant will die. The only cure is to plant resistant marigold cultivars like Cupid, Papaya Crush, Sparky Mix or Gypsy Dancer. Damping off disease most commonly affects seedling marigolds. Affected flowers develop spots or rings of dead tissue. The weakened tissue causes the seedlings to collapse and eventually die. To cure damping off, dig up the affected marigolds then sterilize the soil by spraying a Dithane Z-78 solution (2 grams per liter of water). Flower bud rot is caused by the fungus Alternaria dianthi which causes young marigold buds to shrivel and brown and leaves to develop spots of dead tissue on their edges. Control bud rot by spraying marigolds with a Mancozeb solution (2 grams of per liter of water). Marigolds with collar rot develop black lesions on their stems and rot around the collar. Affected marigolds should be pulled up. Sterilize the soil before re-planting and cut down on watering--excessive moisture contributes to the disease. How Fast Do Marigolds Grow?